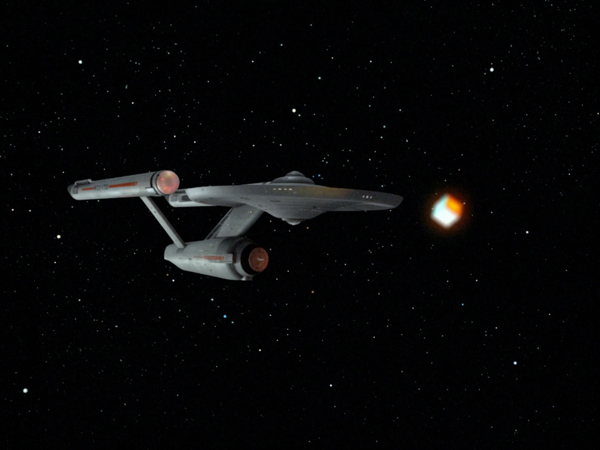 I have a question which might be obvious, but I am not tech savvy so I will ask anyway: Are you limited to using images from TREKCore.com, or can you use your DVDs to do screen grabs? I don't have the technology available to do screencaps from the DVDs -- and, truth to tell, doing so would turn this into a much bigger project that I'd want in something "just for fun". Clicking thru TREKCore is limiting, but much easier!! Correct! I had to remove Kirk's foot from Scotty's hip. Here's a question for the Forum: If I do go ahead with this "lost episode" idea, how should I format it? With the samples above, I've defaulted to standard comic page proportions, 2x3, but for the "project" should I perhaps format the "pages" to a standard computer screen? Wider than they are tall, in other words? Since this is for a computer screen and not for publication, I'd go with a screen format. Maybe even a daily comic strip format, as that works well on a computer screen. I'm enjoying this quite a bit. I'm a more recent convert to Star Trek, and particularly TOS (mostly because of your Star Trek work for IDW) and I've enjoyed the series quite a bit. 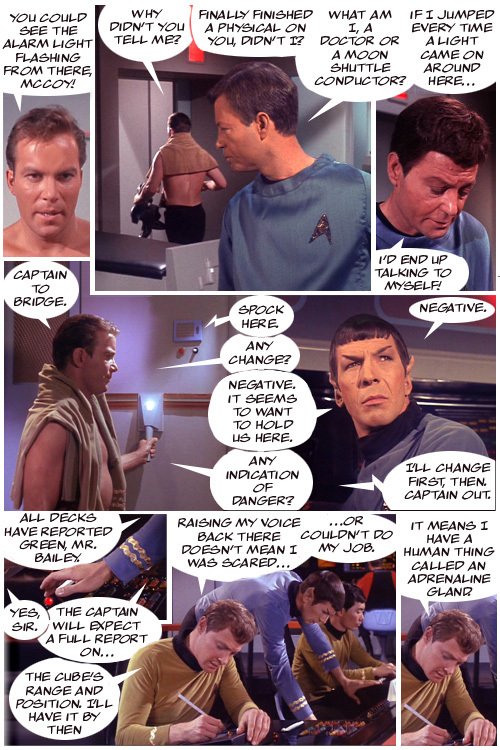 So much so, that I'm doing an imaginary adventure in my comic strip (ala Dickie Dare, my two characters make-believe themselves into the TOS universe). You've inspired me, JB! Whatever format you choose, I'll enjoy, because it's fun watching you experiment and do something "for fun"! 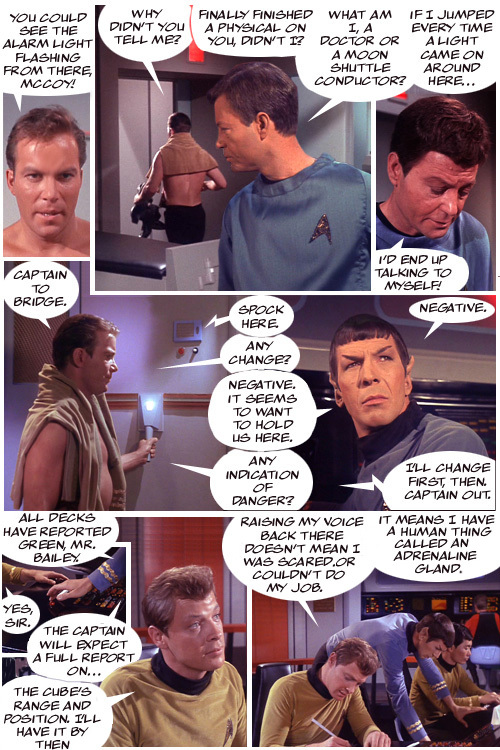 Here's another page -- and it may be the last, dagnabbit, at least for this story. TREKCore skipped a few shots immediately following this, so there's no proper way to do the next moments with Kirk and McCoy. Grrrr. This page has some "tweaking" of both image and dialog, to make it "flow" better in this format. Amusing to note this was the first episode filmed, once the series was picked up, so in his very first scene Shatner has his shirt off! These pages look awesome! This is so cool!! I enjoy the comic page format JB. Very cool! I would love to see a new episode with old guest stars returning and brand new ones -- maybe Adam West, Barbara Feldon or Barbara Eden would be fun to have in a TOS episode. Working on something like this makes me very aware of the mechanical process of TV and movie production. 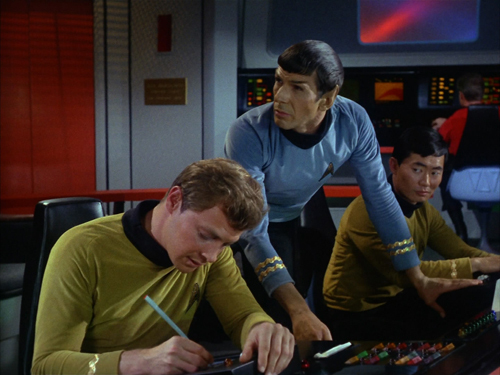 Note that the shot of Spock on the viewscreen, lower left on the fourth page, has exactly the same lighting and camera set-up as the two-shot with Bailey on the first page. I can easily imagine someone (the director?) going thru the script and marking all the shots that could be collected at the same time. I cast my vote with those who would like to see the standard comic book page. There's just something about it combined with the material that makes it feel classic. Great idea and even better execution, JB. Really loving looking at your work here. I vote for the comic page format. What I have seen so far looks great and fun. how should I format it? Assuming this project is a labor of love, I'd go with whatever format makes the task easier for you. Interesting point about shirtless Kirk in his first regular episode scene. 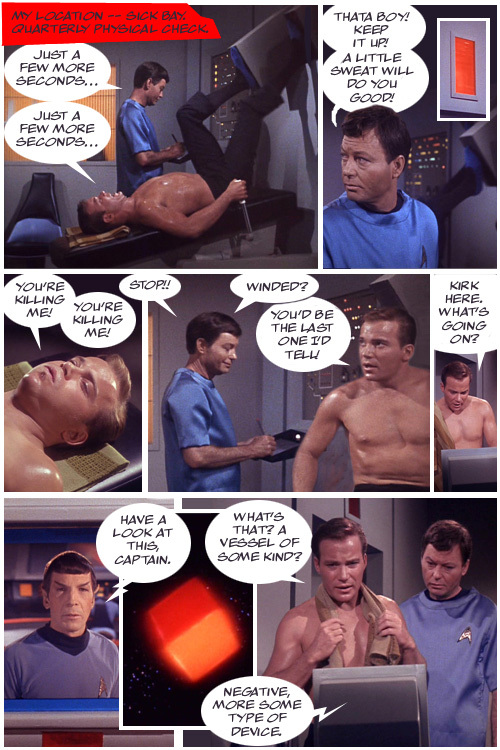 Not to hijack, but it made me think about his wrapped hand at the end of "Where No Man..."; I know his ribs were wrapped in "Journey to Babel," but did Kirk ever get any other bandages or wrappings in all the fights over the other 79 episodes? Bad Kirk in "The Enemy Within" didn't rate one despite some pretty deep scratches, though Lazarus got one for a seemingly minor forehead wound in "The Altnernative Factor." 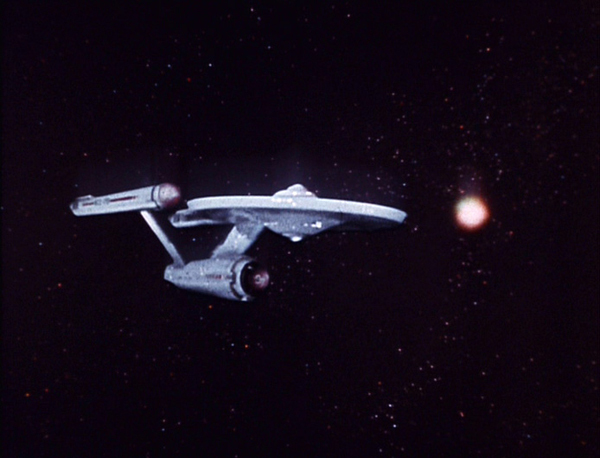 It should be noted that there are both DVD and HD-DVD/Blu-Ray screencaps at TREKCore. One gallery may be more extensive for a given episode than the other. Looking at "Corbomite"'s HD screencap gallery (26 pages vs. the DVD's 16), it looks like the shots you seek would be there. I'm not sure how well the standard and HD shots would mesh, but you could mix-and-match to get all of the frames and angles you want. If the DVD gallery doesn't have a shot, the HD gallery might, and vice-versa. Okay, I "built" the missing shots -- some of you will immediately know where I got the pieces -- and produced another page. Dialog gets a little busy, hope it's not too hard to follow. And altho it's an accurate representation of the scene, I'm not thrilled with the straight duplication of Bailey from one panel to the next at the end of the page. Also -- seeing the first red flag on my plan to use "open borders" on the balloons. Love the "talking to myself" panel! The fifth panel is maybe too crowded and, yes, the duplication is a little jarring. Overall, still works for me. Would have worked better for me, too, if whoever picked the images for TREKCore had gone with the full shot, instead of the closeup! It's frustrating -- on later episodes, they go for so many shots it's almost frame to frame. But with these early ones, it's slim (and seemingly arbitrary) pickings!! 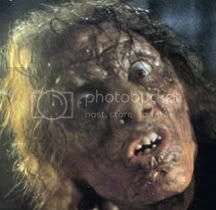 Boy, I really had to DIG to find the Blu-Ray shots -- and even there, the scenes I need are not the ones selected! The fifth panel is maybe too crowded and, yes, the duplication is a little jarring. I may rebuild the bottom tier of my most recent page in order to take advantage of this. Truly Hi-Def images* being available raises another question, tho: Do I rebuild ALL the pages, at an appropriate size for actual publication? No reason to do so, of course, except to scratch that particular itch. No one is likely to want to publish this in actual comicbook form, and the font size would be considerably smaller, creating a potential reading difficulty when the pages are reduced to be posted here. * For some reason the files I have been using are labeled HD, but clearly are not. Exercise is good for you (and us)! Okay, so here's the reworked page. . . Still not a whole lot I can do with that first/sixth panel, unfortunately. I like the standard comic book approach for this project. I think the the strength of that format is that you can pace the story like a real comic book, JB. This is really cool! Thanks for sharing it with us, JB! images have the computer generated Enterprise, not the real one. composites looking better than others. After skimming some of the galleries, it appears that most of the first season screencaps come from the HD-DVD set, which had only the remastered effects. Are we looking at the same site, Greg? There's more than "remastering" going on there!! Again, as noted, the first season screencaps feature only the Remastered/CG effects, but the second and third season galleries have screencaps of both the new and original effects. There are a great many effects shots in those later seasons that could be used in a variety of creative ways. The problem, in this particular instance, is that "Corbomite" has a number of episode-specific effects shots featuring the cube and the Fesarius. You might be able to "create" some new shots be compositing some generic, original-model, HD shots of the Enterprise with the cube, although said shots wouldn't look like the original posted above.